Looking for an Inspirational Story? This One is a Slam Dunk! Basketballs, basketballs, and more basketballs – oh my! When Randy Weinstock, father of Evan, contacted Hands On Hartford back in March we knew great things were in store for a Hartford-based elementary school. Randy sought our consultation on ways that Evan could give back to the Hartford community for his upcoming Bar Mitzvah. Evan, an avid fan of basketball, was interested in connecting his love of basketball with his wish to make a difference. 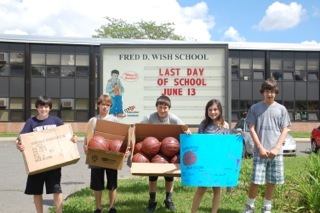 Several ideas were vetted and the selection was narrowed down to donating much needed basketball equipment to Fred D. Wish Elementary School. Evan’s parents wanted to ensure that Evan took full responsibility for the entire process. Moreover, Evan’s parent’s did not want to ask other parents (many of whom celebrate Bar Mitzvah’s regularly) to make yet another contribution. So how would Evan raise the money needed to purchase the items for Wish? By holding a Shoot-a-Thon. Evan asked family and friends to support his effort. 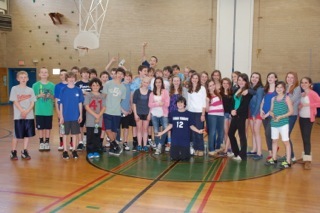 On Friday, May 11th, 56 kids participated in the one hour Shoot-A-Thon held at Evan’s school, King Philip Middle School. Each basket, there were a total of 6, had approximately 7 eager shooters, who were each given 1 minute to make as many baskets as possible. Different points were assigned based on where the shooter connected with the basket. As the points racked up, the thermometer, drawn on a poster board, peaked. The goal was to make 1,000 shots in 1 hour. When the kids reached 990 points, Evan ceremoniously shot the last 10 points. The fun-filled event was a huge success. Evan raised over $1,000. 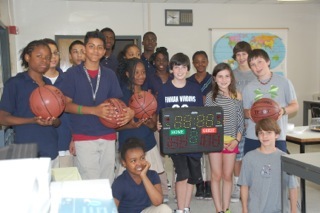 With that, he was able to purchase basketballs, pinnies and an electronic scoreboard. With the monies remaining, the Weinstocks were able to make a $250 cash donation to the school. On May 23rd, the Weinstocks delivered their donation to the school. This project was meaningful and impactful because Evan had an opportunity to visit Wish, which is merely 10 miles away from King Philip, beforehand to see the material differences and needs of the school. We are excited to announce that our MANNA Community Pantry (formally known as Assistance & Advocacy) is renovating to a full shopping model. This new model will provide more nutritious food options, nutrition education – such as providing recipes and cooking demonstrations, and provide more formalized case management services. A full shopping model food pantry gives our clients the ability to shop by wandering through assorted aisles, giving them options to best meet their family’s nutritional and cultural needs. Imagine not being able to quickly run to the grocery store to pick up items for dinner. Donate the items for this recipe so another family can enjoy this delicious meal! Heat the oil in a 12-inch skillet over medium-high heat. Add the chicken and cook until it’s browned. Remove the chicken from the skillet. Pour off any fat. Appetite for Change is our summer and fall initiative to help fund the renovation and to start filling the shelves with more nutritious options for our clients. Be on the look out for ‘Save the Date’ cards for our fundraiser in November! Although the weather was dismal and uncooperative – the work that took place inside of Hartford-based Salvation Army Marshall House was transformational. On Saturday, June 2nd, 25 students and leaders of Ellington Congregational Church’s high school mission group, TELOS, embarked on a major initiative to make the Marshall House, a family shelter, more inviting and less institutional. The youth group , who spent their entire Saturday (9am-4pm) beautifying the facility, were divided into two groups. Half of the team painted the dining room and the other, the very lengthy hallway. All bulletin boards were pulled down so that the students could properly paint the walls that were once cream colored. They scrubbed the walls and applied two fresh coats of a subtle lemon – which turned out to be very invigorating and uplifting. While the paint was being applied in the hallway, the other half of the team painted the dining room using three different colors. The doors were painted brown, the upper portion of the walls a caramel color, and the paneling which occupies the bottom portion of the wall was painted white. It was truly a huge undertaking that initially appeared to be a walk in the park. 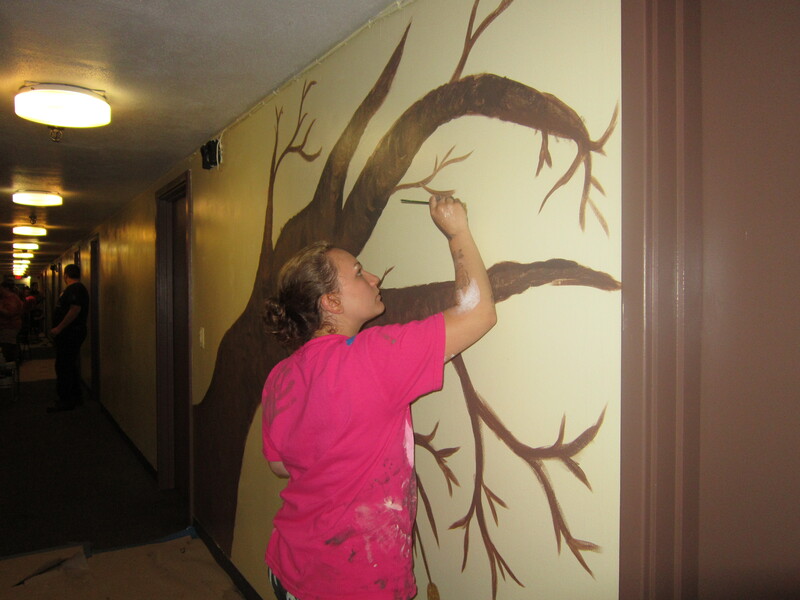 After lunch, the hallway team returned ready to create murals. Because Hands On Hartford staff encountered problems with the projector (intended to project the images on the walls) the youth group had to draw t he images free hand – which is a piece of cake when you’ve got an arsenal of talented artistic youth! 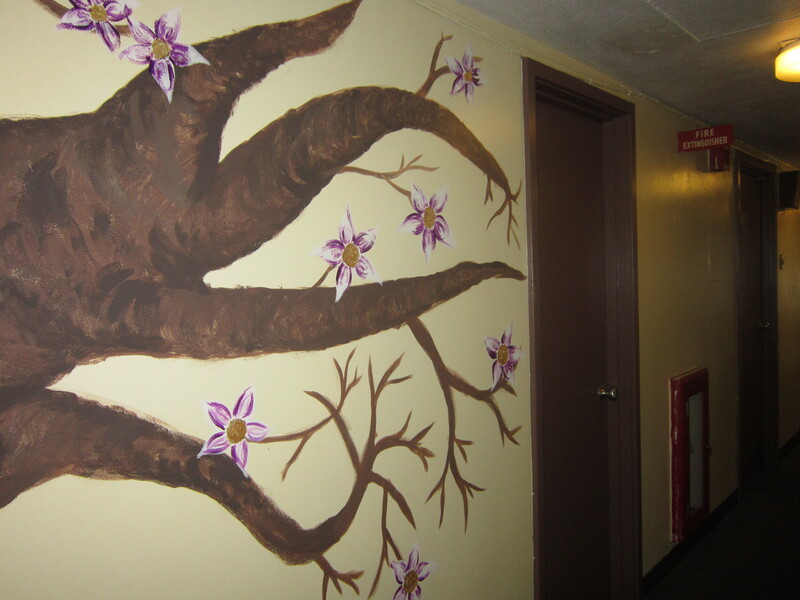 The team drew three impressive and massive floor to ceiling murals that had a tree motif. The muralists were so engaged with their work that when it was time to wrap up, they missed reflection and almost missed their bus. That’s how dedicated this group of youth was to completing the task presented to them. At the close of the day, we concluded with a reflection activity that included writing inspirational note cards to the residents of the shelter and delivering them. By the conclusion of the project, the sun came out and the light from the sun paled in comparison to the warmth that shone through the beautiful work completed inside. Thanks to Generation On for supplying wristbands, that served as mementos, for the occasion. And special thanks to TELOS, an amazing group of diligent students with incredible stick-to-itiveness, for providing nearly 180 volunteer hours to Marshall House!